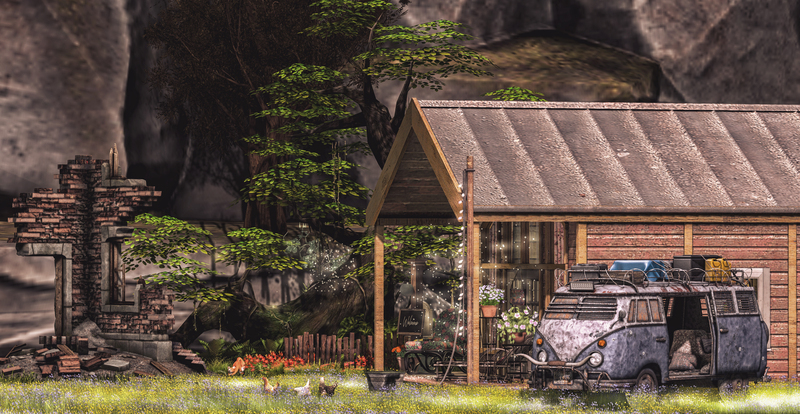 ⌛Almost time to step back in time⌛ In this post I am going to introduce some designers from The Vintage Fair that I have never had the pleasure to post and those are Hello Dave, JACKALOPE, Navzar and 1313, also Zisp who are at The Darkness Monthly Event. Keeping with “That 70’s Vibe” this post is a slight spinoff of my previous post only this time you get to see my outfit, Again, I am totally out of my comfort zone BUT I am having soooo much fun! I hope you love what I have put together for you. All information is below, Enjoy! The Fantasy Faire is OPEN and this is the 10th year anniversary! We are on a special missions so all proceeds will go to KNH Hope Hostel in Nairobi, Kenya, click the link to find out more! The Pictures I will explain, I lost my Mother to Cancer in 2003, my world changed in an instant and I had to adult… fast. So I am trying to show a transition from a world of not having to be that responsible to a world of reality, a caterpillar to a butterfly.. kinda. The butterfly in the picture that I hold represents my Mother, a sacred beauty that I could not keep, In the other picture I am chasing a butterfly and that represents my dreams of her.. the dream is real and then I wake and she is gone, I feel as though I am chasing something beautiful that cannot be held nor touched, heard nor spoken to until I gain my wings and join the other beautiful butterflies.